Ask young children to count the colors in this giant “Dr. Seuss” hat. Color Rules! Red hot or not, it’s a known fact that color captures kids’ attention. Wow your students with cool color facts, like this one: Research shows that in the year 1587, a shipment to Spain of tiny red-dye producing insects were as valuable as gold and silver in the Spanish Empire of that time. Think of the array of colorful teaching resources that you’ve used so far this school year. Walk out of your classroom and back in again looking for nothing but COLOR. It’s everywhere. Color is a key factor in the design of learning spaces, teaching places, educational and recreational resources for children. Pair color with concepts that young children need to master, and you’ll create winning attentionology tools and tricks. HAT TRICK – For example, use a large colorful hat and a small colorful easy-to-move figure to help young children learn spatial concepts. Place the figure in different locations with the hat, and ask key questions about the relationship of one to the other. Invite the class to repeat the question and answer to reinforce the concept. Let the children take turns handling the soft stuffed toy to experience different spatial relationships first hand. “Where is Happy now?” Instruct the kids to ask the question with you. Children love to play games of hide and go seek. Tickle their minds with the concept of hiding UNDER something. The colorful hat in this learning game helps hold students’ attention, because color rules! The soft cute animal figure adds to the fun in learning these concepts. 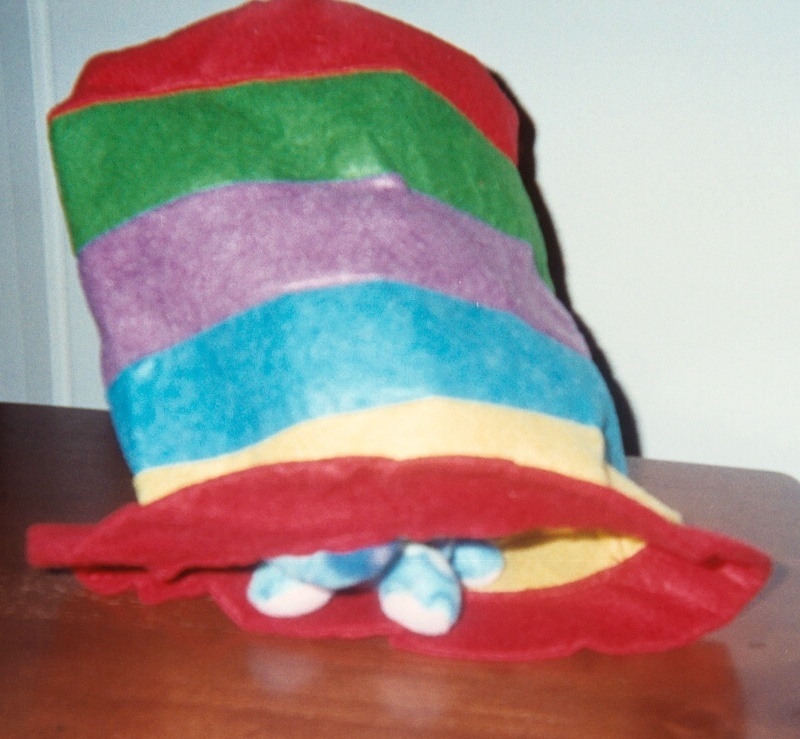 Use a large multi-colored hat to help young children learn colors in the process of learning spatial relationships. Ask volunteers to name the colors in the hat. That done, ask the kids to name the colors that are CLOSEST TO Happy Hippo when the hippo is hiding UNDER the hat. As you can see here, Happy is CLOSEST TO the colors red and yellow. Move Happy to the hippo’s next spatial stop and invite the kids to open their eyes. “Look! “Now Happy Hippo is sitting ON TOP of the hat! Teaching spatial concepts in this manner works with any kind of colorful hat and animal; it doesn’t have to be a hippo, of course. The attention-getting elements you’re using in this activity include bringing the character to life by giving it a name and making it move in significant ways – personification and dramatic movement – powerful teaching tools. Children remember colorful and personified characters and materials. 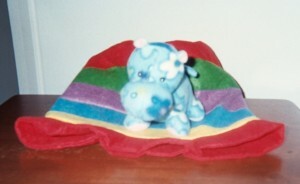 This means that once you’ve introduced a large colorful hat and a little animal, like Happy Hippo, you can tuck it away for later use. Put these elements to the test. Surprise your class by bringing the colorful hat and animal back, like old friends visiting again. See if students recall the concepts that you taught with the hat and the animal; concepts like spatial relationships. Ask who remembers the animal’s name. Ask who remembers what the animal did with the hat. Invite students to call out the colors in the hat, yet again. 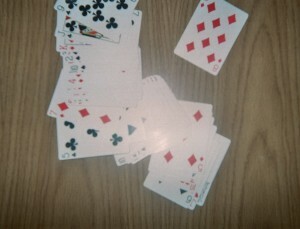 CARD TRICK – Hand out playing cards and let the kids deal the decks. “One, two, three, throw!” The playing cards will be SCATTERED ABOUT on the table. “One, two, three, throw!” The colorful playing cards are scattered about. Scattering is a spatial concept. After you discuss the spatial concept of scattering, divide up the card packs among student teams and tell the class that you have treats for teams who correctly add up the numbers they hold in their hands. Immersing kids in math and science, including spatial relationships, at a young age will help prepare them for the challenging curriculum they will likely face in later grades. These descriptions of teaching spatial concepts are just a few examples of how you can use color and easy-to-move objects to help children learn. 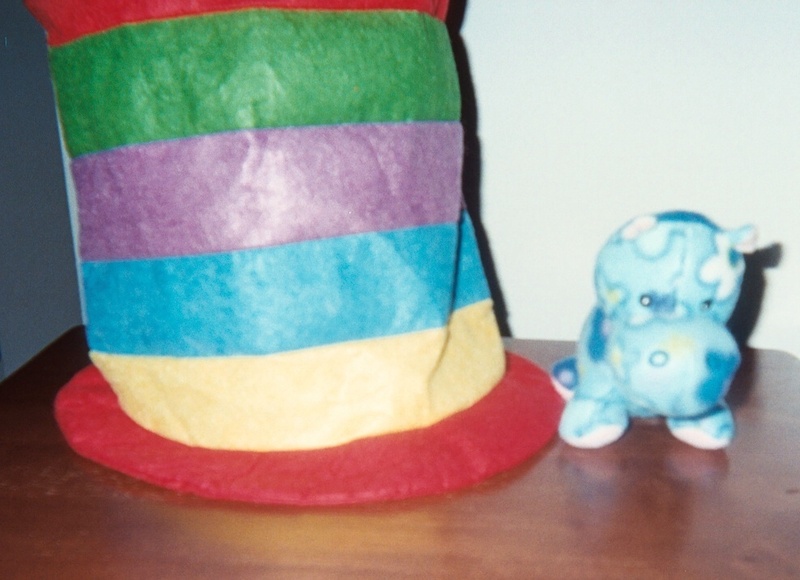 Simple, inexpensive teaching tools, like a $1.00 (US) large multi-colored hat and a $1.00 (US) little stuffed animal can be amazingly effective and multi-functional as teaching tools in the hands of creative teachers! Please send comments about how you use color to catch and keep kids’ attention. Check here on Wednesday for Mid-Week Focus. 2 Pings/Trackbacks for "Color Rules Catching Attention to Teach Spatial Concepts"